I have never made New Year’s resolutions because I knew I would never keep them. This year, I kept encountering blog post after blog post by those who chose to do One Word for the year. They call it the un-resolution. They also have a blog, if you’d like to subscribe. The more I saw others choosing a word, or having the Lord choose one for them, the more I liked the idea of clinging to one word for the New Year. So, I thought I would try it this year. But only if the Lord gave me the word. I didn’t want a word that I choose for myself. I waited. And as I waited, I decided that, if the Lord gave me no word, I would have a backup. I would use this Scripture, “For I know the thoughts and plans that I have for you, says the Lord, thoughts and plans of welfare and peace and not for evil, to give you hope in your final outcome.” (Jer. 29:11 Amplified) A great Scripture for the year, right? Then, without warning, came the first word: cautious. I decided to look it up. Cautious partially means: to be cautious is often to show wisdom. Webster’s Unabridged, New Edition, 1881, defines it as “attentive to examine probable effects and consequences of measures, with a view to avoid danger or misfortune.” Synonyms are prudent, guarded, wary, circumspect, watchful, and vigilant. Ooo…sounds good to me! Unexpectedly, another word came: journey. Part of journey’s definition means passage or progress from one stage to another. Even more unexpectedly came two more: dwell much. Therefore, I will dwell much in the Lord and be cautious in my journey from one stage to another throughout the coming year. The Lord, then, plopped an idea into my noggin. Throughout this year’s journey, I’ll be posting once a month on journey. More about this in an upcoming post. You’re invited to come along with me. Will you join me on this journey and see what exciting things we encounter? I love the verse you chose containing the special words which spoke to you. It it a perfect example for a Biblical woman of wisdom to follow. May you be blessed to overflowing this year Lynn in everything you lay your heart and mind to. Blessings, Elizabeth. One word. That is a challenge when your mind is overwhelmed with thoughts and ideas. One word. I think mine would be TREASURE. Treasure everything God has given me: faith, family, home, this beautiful world, every precious moment of life. Yep, treasure. Great idea, Lynn. Thanks for sharing. Looking forward to journeying with you this year, Lynn! I love your way of thinking. 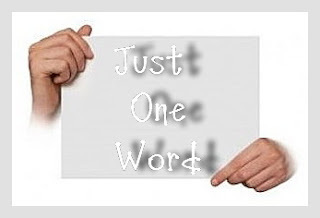 I also joined the One Word movement, my word? Discipline. Lynn – love this post! What a great concept of choosing “one word” to dwell on in the upcoming year! I love your choices of cautious, journey and dwell. Can’t wait to read the continuing theme of “journey” – for that is really what life is about. My “one word” will be TRUST. This past year was filled with surprises that were not all good or easy to swallow. I will choose to “trust in the Lord with all of my heart and lean not on my own understanding” (Prov. 3:5). I will trust in His faithfulness, grace, love and sovereignty. Thanks for this challenge. I love your ‘journey’ to your year-defining word! My word this year is MORE. More of all Jesus. More prayer. More time with Him. More of His power and presence. More of His will, not mine. More of Him. But wanting more of Him means I must give Him more of me. And so this year, I want MORE of Him and to give Him MORE of me. Mine sort of goes along with what you’re saying. It’s L-I-V-E. I want to Live Big this year, and when I asked God what that would look like, the words that came to my mind were: Legacy, Investment, Vision, and a practical one, Exercise (L-I-V-E). I made file folders and the first page has a list of things I want to do in relation to those four “goals.” The Legacy one already has four ideas that I’m going to strategize to accomplish this year. So I’m sorta journeying with you. Blessings to you, Lyn… and hello, Marja! Elizabeth, thank you so much. Especially for the blessing! You’re a dear! Mucho blessings to you! Ceci, what a great word! Very good choice! Thank you for taking time to stop by. Blessings of peace to you, sweetie! Thanks so much, Carol! So glad you’ll come along! Bless you! Wow! Kristin, what an intimidating word! Whew! May it truly be a blessing! You’re such a dear! What a solid word, Deborah! So glad you’re taking the challenge. Thanks for being such a faithful follower! Bless you! Marja, Marja! I am always so happy to see you here. You are my most faithful follower. You bless me with your presence. Thank you. Blessings to you! Wow! Stephie, that’s an interesting word. All kinds of outcomes for it. May it be a blessing to you! Thanks, sweetie, for commenting. Love that you’re here, sweetie! Yay! So happy to see you, Michael. And what a great word for your sermon series! Thanks so much for stopping by. Bless you! LOL That’s okay, Dawn! I get it spelled all ways. I’ve been called worse things! LOL Wow! I’m impressed. What a great idea! I might have to do the same thing. I’ll try to keep up with your journey! We can compare notes! Blessings to you! Lynn, I’ve emailed you an article, let me know if you can use it. LOL Marja, I was just trying to figure out who TravelingLight was! Thanks for letting me know! At first I thought journey would be an appropriate word for me as well, as I am on the journey of a new career. Next I thought it should be new as there is so much new to learn. But now I think “open”is the most appropriate as in being open to my new opportunities, and journey through learning. Christine, that sounds like a great word. Great choice! Blessings to you! Great post, Lynn! I look forward to more on your journey. I think my one word would be Love. There are so many good ones that all point to God, who is Love. Blessings to you on your journey through this new year. Thanks so much, sweet Connie! Always happy to see you. And what a great word you chose. Always the best! Blessings to you! Mary, thank you and you’re very welcome! And I LOVE your word for the year. Going deeper into God is always something we should desire. Blessings to you!